Islamic calendar or Muslim calendar also called the Hijri calendar is the calendar used to date events in many predominantly Muslim countries, and used by Muslims everywhere to determine the proper day on which to celebrate Islamic holy days or other Islamic Occasions. 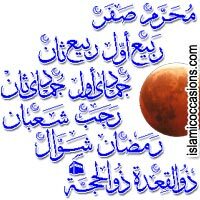 Islamic calendar or Muslim calendar is a lunar calendar having twelve lunar months in a year, the beginnings and endings of which are determined by the sighting of the crescent moon (new moon). These lunar months (lunations) are based on the motion of the moon, and because 12 synodic months is only 12 x 29.53=354.36 days. Therefore the Islamic calendar is consistently about eleven days shorter than a tropical year or solar year. Islamic holy days, although celebrated on fixed dates in their own calendar, usually shift eleven days earlier each successive solar year, such as a year of the Gregorian calendar or Christian calendar. Muslims do not adjust their Islamic year by adding an extra month, as the Jews do to keep their lunar calendar in synch with the seasons. Hence the months of the Muslim Islamic year do not relate to the seasons which are fundamentally related to the solar cycle. This means that important Muslim festivals, which always fall in the same Hijri month, may occur in different seasons. For example, the Hajj and Ramadan can take place in the summer as well as the winter. It is only over a 33-year cycle that lunar months take a complete turn and fall during the same season. As we already know the Islamic calendar or Muslim calendar is derived from the phases of the moon, the Fasting month of Ramadan falls a little earlier each year. The effect of this is to balance out the discrepancy between Fasting in the northern and the southern hemispheres. It is often thought that in certain parts of the globe the fast will be easier than in others, for the length of the day, as well as its temperature, varies from season to season and from land to land. But Ramadan, creeping forward at a rate of about eleven days in each solar year, ensures that wherever one may be on the planet, the fast will fall sometimes in winter and sometimes in summer. Similarly although in high latitudes the days can be long, there is no heat. A balance is thus obtained, so that Fasting is similarly efficacious all over the world. Although new moons may be calculated quite precisely, the actual visibility (by a human observer's eye) of the crescent is much more difficult to predict. It depends on many factors such as weather, the optical properties of the atmosphere or atmospheric pollution, the altitude of the moon at sunset and its closeness, the quality of the eyesight of the observer, the location of the observer and etc. It is therefore very difficult to give accurate information in advance about when a new month will start. Furthermore, some Muslims depend on a local sighting of the moon, whereas others depend on a sighting by authorities somewhere in the Muslim world. Both are valid Islamic practices, but they may lead to different starting days for the months. Islamic years are called as Hijra (Hijrah) years, these Hijra (Hijrah) years are counted since the Hijra (Hijrah), which is when the Prophet Muhammad (pbuh) migrated from Makkah to Madina (formerly known as Yathrib) approximately July 622 CE. Thus each numbered year is designated either H or AH, the latter being the initials of the Latin Anno Hegirae (in the year of the Hijra). All the events of Islamic history, especially those which took place during the life of the Prophet Muhammad (pbuh) and afterwards are quoted in the Hijri calendar era. Hijra (Hijrah) of the Prophet Muhammad (pbuh) is an important turning point for the Muslim community. After the emigration, the Muslims were able to organize and establish the first real Muslim "community," with social, political, and economic independence. Life in Madina allowed the Muslim community to mature and strengthen, and the people developed an entire society based on Islamic principles. It is indeed, a unique occasion to ponder that the Islamic Era did not start with the victories of Islamic wars, nor with the birth or death of the prophet (pbuh), nor with the Revelation itself. It starts with Hijra, or the sacrifice for the cause of Truth and for the preservation of the Revelation. It was a divinely inspired selection. Allah wanted to teach man that struggle between Truth and Evil is eternal. The Islamic year reminds Muslims every year not of the pomp and glory of Islam but of its sacrifice and prepares them to do the same. Hence, Muslims do not traditionally "celebrate" the beginning of a new year, but we do acknowledge the passing of time, and take time to reflect on our own mortality. The Islamic year begins on the first day of Muharram with the remembrance of great sacrifice of Imam Hussain (pbuh), the grandson of the Prophet Muhammad (pbuh) on the land of Karbala for the sake of Truth. Due to different transliterations of the Arabic alphabet, other spellings of the Islamic months are possible.